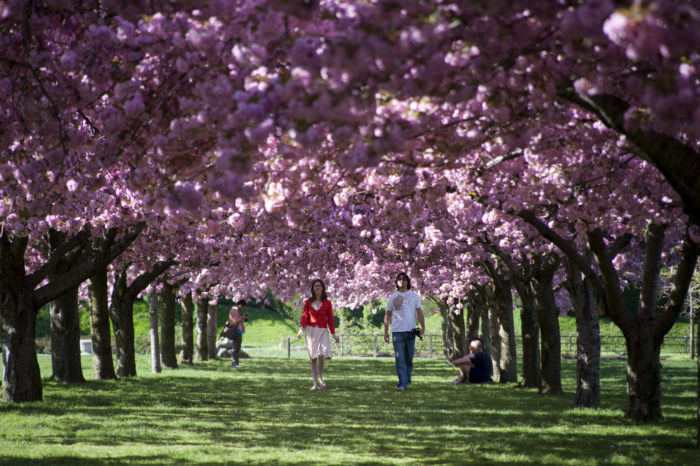 March 28, 2019 – April in NYC means a new rooftop garden commission at the Met, Earth Day events throughout the City and cherry blossom viewing at the Brooklyn Botanic Garden. There’s plenty to look forward to indoors too, including the New York City Ballet’s spring season, the Tribeca Film Festival and a series of events taking place at the City’s newest cultural hub, The Shed. For details on these and many other happenings, read on. For two weeks, the clothing and accessories won’t be the only colorful items on display at Macy’s. During its annual flower show, the iconic department store hosts beautifully bright floral arrangements, live music, kids’ activities and seminars. Visit the Macy’s website for more information on this year’s theme. Soundtrack of America opens The Shed with a five-night concert series celebrating the unrivaled impact of African American music on contemporary culture with performances by today’s most exciting emerging musicians. Conceived and directed by Turner Prize-winning artist and Oscar-winning filmmaker Steve McQueen, and developed with music visionaries and academic experts, Soundtrack traces a musical “family tree” of spirituals and blues, jazz and gospel, R&B, rock and roll, house, hip hop, and trap that has inspired a new generation of artists who continue to develop that legacy. Each year on Easter, celebrants don festive finery and show off their very best bonnets along Fifth Avenue. Immortalized by Irving Berlin (with some help from Judy Garland and Fred Astaire), the pageant is a New York City tradition that stretches back to the 1870s. Starting at about 10am and continuing until 4pm, the parade marches north on Fifth Avenue, from 49th Street to 57th Street. The best place to watch is from the area around St. Patrick’s Cathedral; better yet, bring your bonnet and join the parade. Cherry-blossom viewing, known as hanami, is a centuries-old Japanese custom, a springtime occasion for merriment and the contemplation of life’s beauty and transience. You can partake in this tradition at the Brooklyn Botanic Garden, home to scores of flowering varieties for public enjoyment. Guided tours focusing on the blooms are held on Wednesdays during the April viewing season, though the more-frequent garden tours touch on them as well. The month culminates in a celebration of the brilliant blooms with Sakura Matsuri (April 27–28), a festival of Japanese performances and cultural happenings. The Tribeca Film Festival—launched after 9/11 to promote the cultural and economic revival of Lower Manhattan—provides a platform for innovative filmmakers to present their latest work alongside some major movie premieres too. The 2019 program will feature films of all stripes: crowd-pleasing blockbusters-to-be, provocative documentaries, foreign films, shorts and a cornucopia of panel discussions and lectures. There are also sections of the festival devoted to TV and online programming and experiential works, including virtual reality and multimedia projects. Punk exploded onto the scene more than 40 years ago, changing the landscape of music and influencing other media. In this exhibit, the Museum of Arts and Design explores the history of graphic design and how the punk and post-punk movements helped reshape the art form. More than 400 graphics, album covers, flyers and zines—including handbills from CBGB and concert posters for Blondie and The Ramones—are on display to illustrate the story.